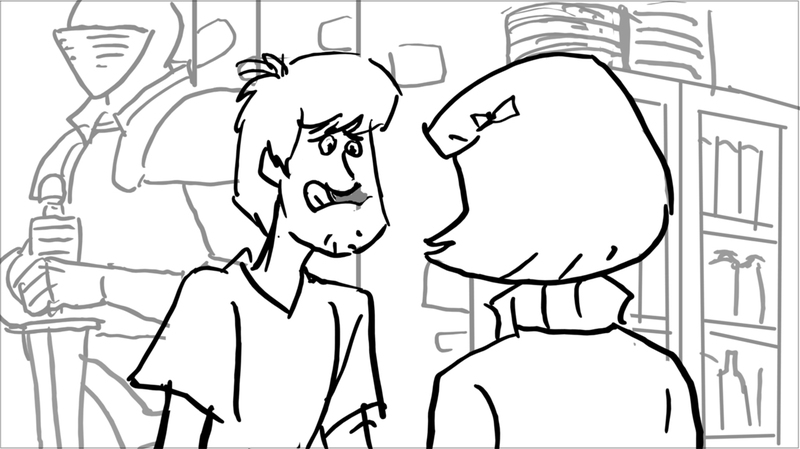 This is one of two storyboards I did on Scooby Doo in 2009/10. Like many, I have fond memories of watching the first season of “Scooby Doo, Where Are You!”, when it premiered in 1969. I found the series engaging enough as a 10 year old, partly as an acceptable successor to “Jonny Quest”, and partly because I LOVED animation. During this period, I used to watch favorite live-action series like “The Man From Uncle” and “The Wild Wild West” and wish, not only that they be animated, but animated like H&B cartoons (with the flat plans following running or walking characters cut off at the waist (to save animation) and the streaky dark gray b.g.s (my family didn’t get a color tv until after I left for college.)) I decided that I was going to be an animator, and worked to hone my skills by drawing comics (I couldn’t draw the same thing twice, let alone 24 times per second, so I figured comics would be good practice). By the time I was 12 I had jilted my first love for the new graphic inamorata. I didn’t watch another TV cartoon until I started storyboarding them for a living in 1983. I have no idea what changes were wrought in the Scooby mythos during this period (or later, when Hanna-Barbera was absorbed into Warner Animation). In 2009, I was freelancing on the new version, “Scooby Doo! Mystery Incorporated”, and appalled by the reworking in evidence. Suddenly the four leads had backstories, parents, an origin town named “Crystal Springs”. Shaggy & Velma, Daphne & Fred were sexual beings, romantically involved with each other in ways I found perverse (Velma was jealous of Shaggy and Scooby). As a wise producer once advised me, “Don’t breath on it too hard”. The 2009 Scooby iteration had definitely gotten too much CO2. Today, I find these qualms amusing. I rather like the more adult, fleshed-out byplay between the characters. The sequence presented here is rather charming, to my 2018 sensibilities. I am amused by the irony that the brains of the ensemble, Velma, had a witch for a mother. (I’m intrigued that Velma’s Mother wears the symbol for the Al-Anon Fellowship around her neck. Does this mean that Velma had an alcoholic father?) I am relieved by the abandonment of the trope that all of their occult encounters must be revealed as con-jobs. I may have to go back and actually watch this series. Action: -nervously, tentatively, they start to reach for each other, oblivious to Velma’s Mother as she enter behind counter, carrying CURSE BOOK. Action: VM lets CB drop onto counter top. (SFX); LOUD BANG; SLIGHT CAM JAR- Cloud of dust rises from CB impact; cups flip over, spilling contents. Action: Shaggy and Velma turn towards VM. Dust cloud spreads, starts to disipate. Action: REVERSE ANGLE, OTS curse book and VM’s hand indicating specific passage. Velma and Shaggy look down at book. Action: -then back at o.s. VM. Action: Shaggy turns toward Velma; she and VM turn to look at him. Action: -turns towards o.s. Shaggy. Action: VM and Shaggy are looking at Velma. Shaggy. Shaggy is reacting with enthusiastic excitement to Velma's great realization. Action: Velma and Shaggy stare despondently at o.s. VM. Action: Three shot; VM looks at Velma; Velma and Shaggy stare at each other. Action: VM turns toward Shaggy; They look at VM. Action: CU UPSHOT on Shaggy, looking at o.s. VM. Action: Shaggy gets an idea. Action: He turns toward os. Velma. Action: He gestures as he speaks. This is one of two storyboards I did on Scooby Doo in 2009/10. I’m pretty sure of the date, since this board, for episode 345-623 (“Attack of the Headless Horror”) was done while I was trying to learn Storyboard Pro (now the industry-standard software for doing boards). Back then, it was still optional to do paper boards, but I was about to start work at the (then) start-up studio, Bento Box Entertainment, on its first series, the now-forgotten “Neighbors From Hell”. A requirement of this pending staff position was that I be able to use said cutting-edge software. I was somewhat miffed that my director/producer, Vic Cook, only gave me 2 script pages, but, as it turned out, I needed every minute of the 3 allotted weeks. I had two steep learning curves 1) How to navigate SBPro; 2) How to draw on my first-ever Cintiq. Actually, this might not be my FIRST storyboard using the Cintiq & SBPro; the other Scooby board (also done in SBPro) has the episode #345-608, so it was probably done before this one.Looking at my Morning-Pages journal from the week of September 19 to 25, I read descriptions of my difficulties boarding an unnamed Scooby Board (using SBPro) for Mr. Cook. Probably not this one, because I groused (in my journal) about have to draw 5 characters walking and talking. I probably worked #635 the following Spring during the fallow period between the end of “Neighbors from Hell” and the beginning of “Bob’s Burgers”. Action: C.U. on Velma’s Mother pouring coffee. Action: Shaggy reaches IN, grabs cup handle as VM continues pouring second cup. Action: H.U. ; VM continues pouring second cup as Shaggy holds handle of his cup. Action: Shaggy lifts cup to his face as VM stops pouring, straightens, looks at Velma. Action:…and crosses O.S. as she says dialogue. Shaggy and Velma turn to track with VM. Action:.Awkward moment of silence as Velma turns back toward Shaggy and they sip their hot chocolates. Action: MCU on Shaggy, reacting nervously as awkward silence continues, looking down at his chocolate. Action: Shaggy looks up furtively at o.s. Velma. Action: MCU on Velma, looking down at her chocolate. Action: She glances up at o.s, Shaggy. Action: CU on Shaggy; this is getting painful. Action: He looks back down at his chocolate. Action: CU on Velma, looking at o.s. Shaggy. Action: She lowers cup O.S., revealing chocolate mustache. Action: H.U. pose; Velma completes “mustache wipe”. Action: Shaggy turns toward her as she speaks, lowering cup, revealing his own chocolate mustache. Action: H.U. pose; Shaggy completes putting o.s. cup on o.s. counter; OTS Velma. Action: OTS Shaggy on Velma.